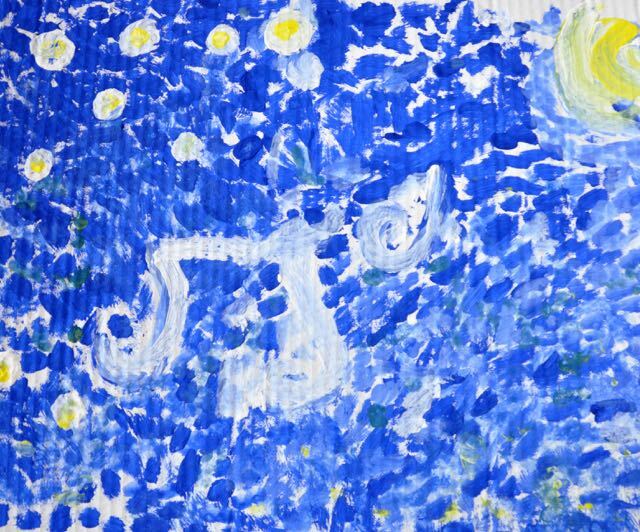 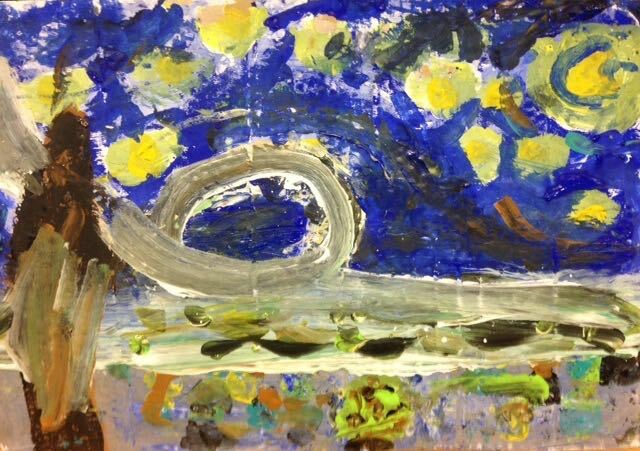 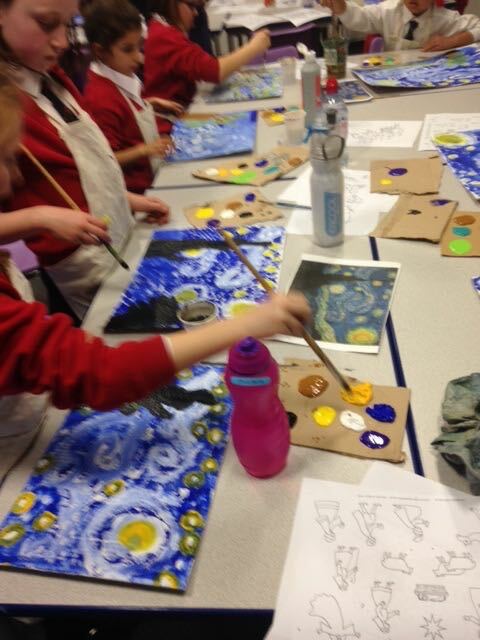 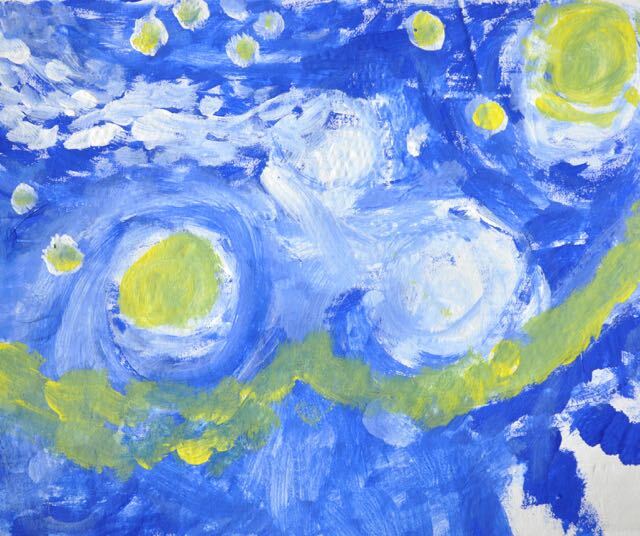 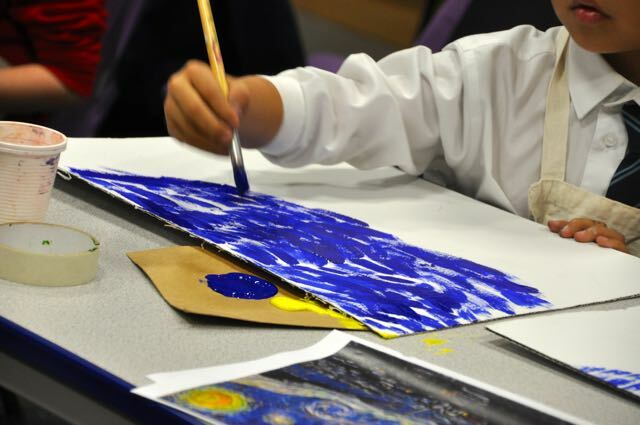 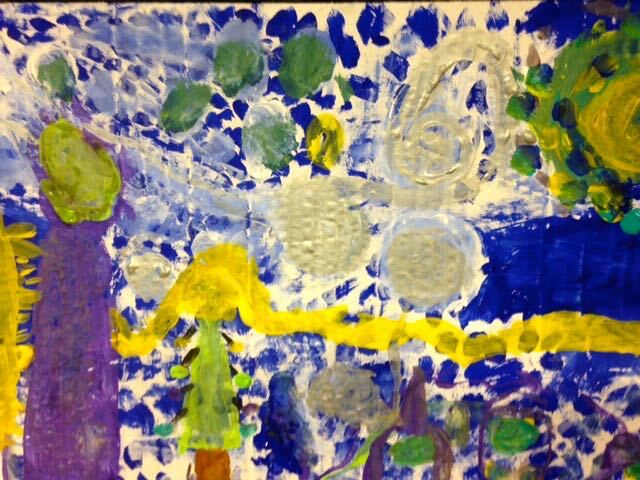 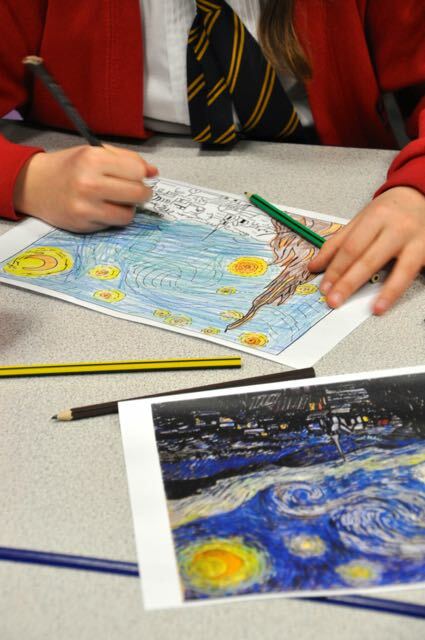 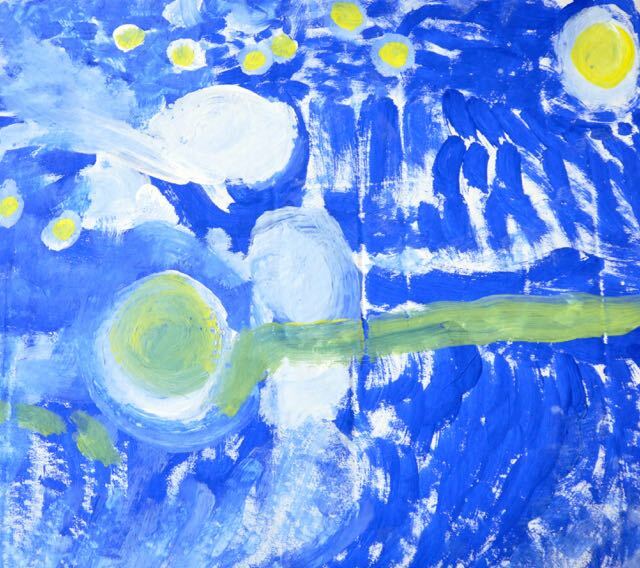 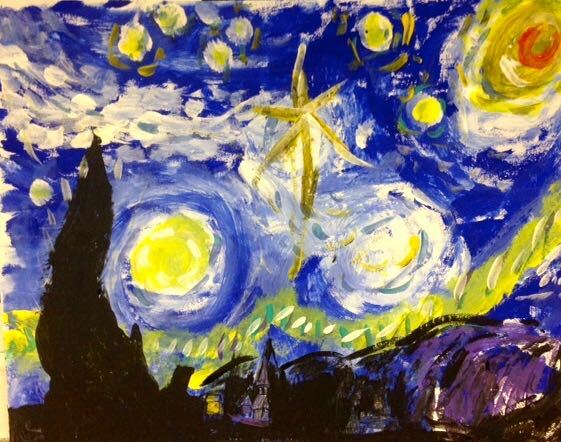 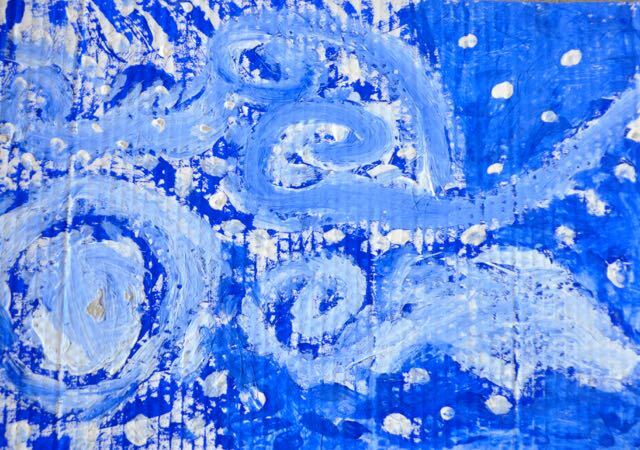 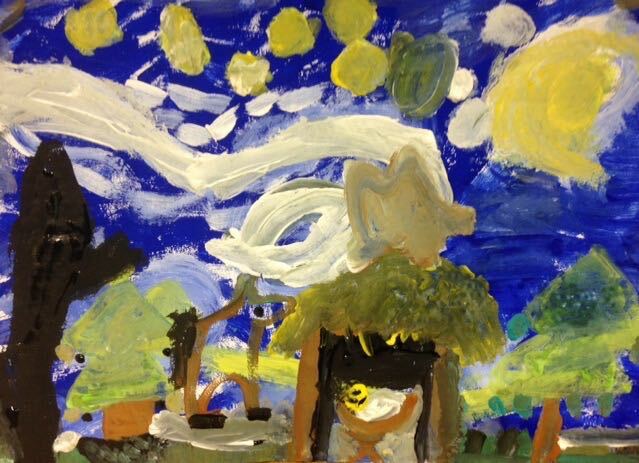 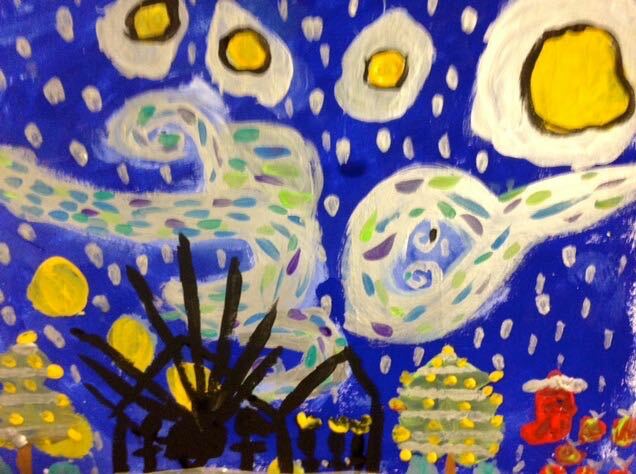 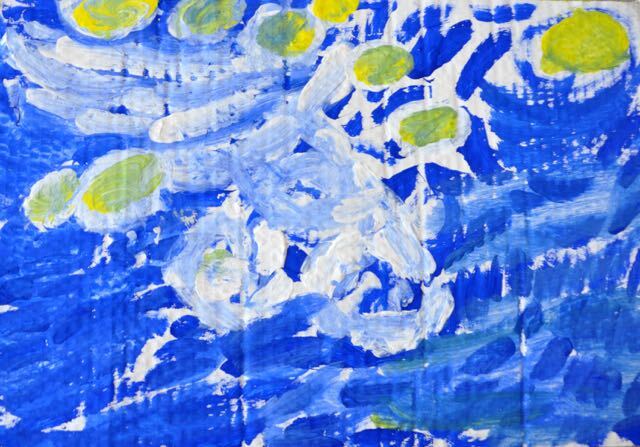 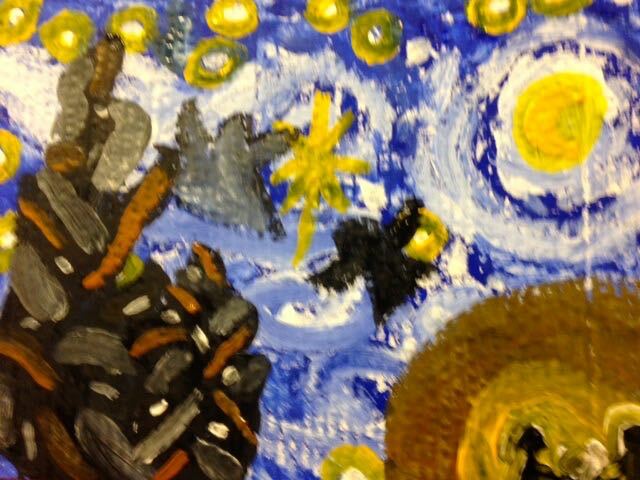 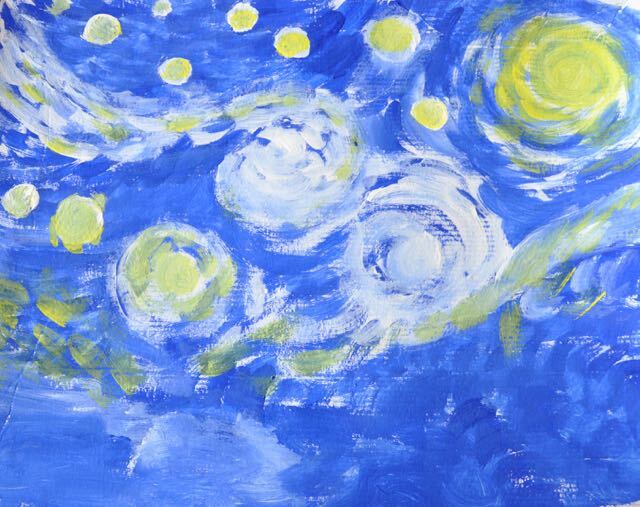 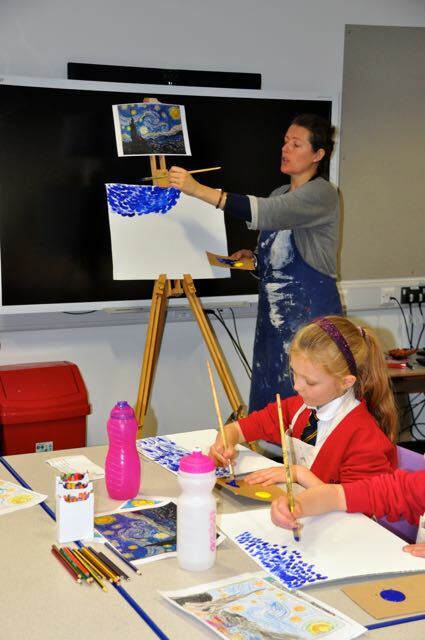 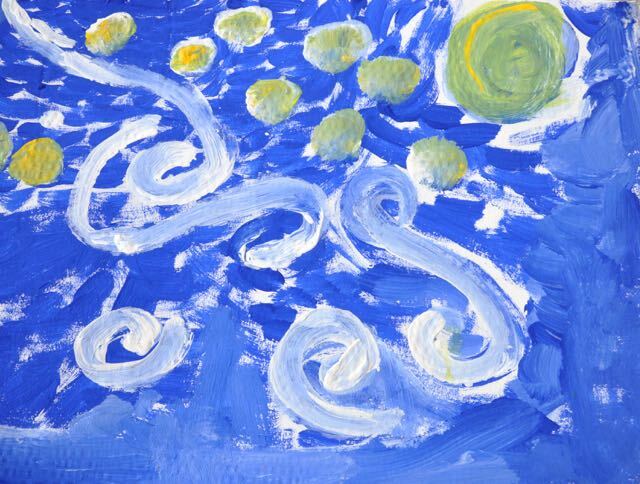 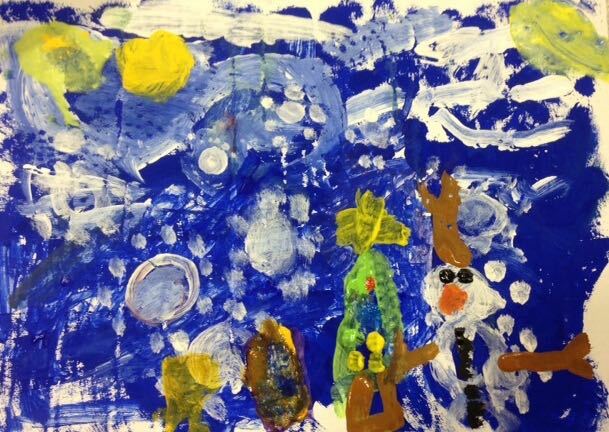 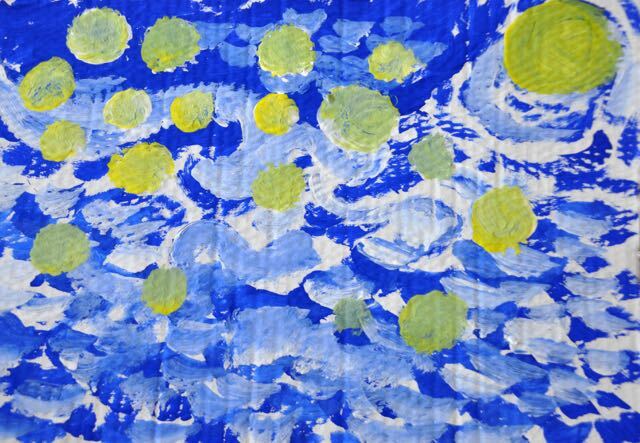 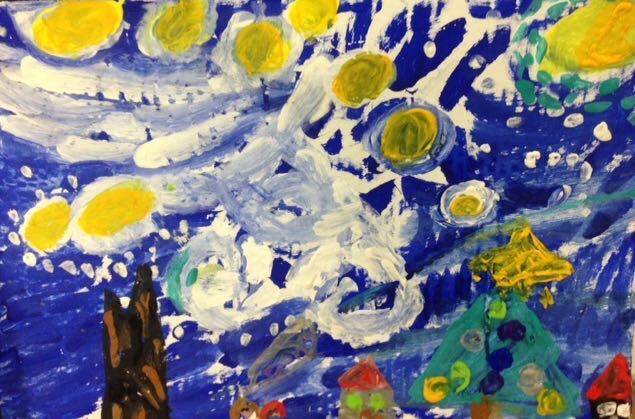 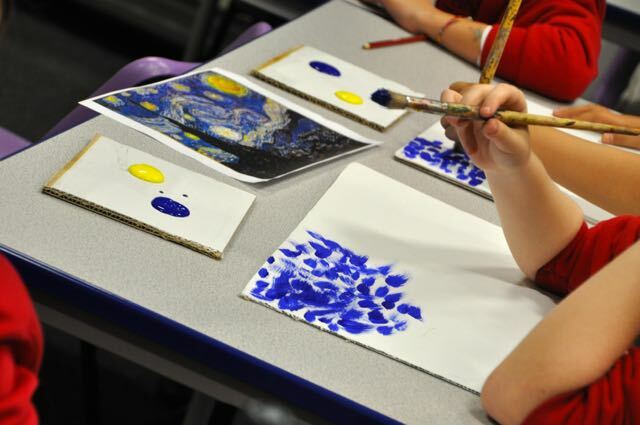 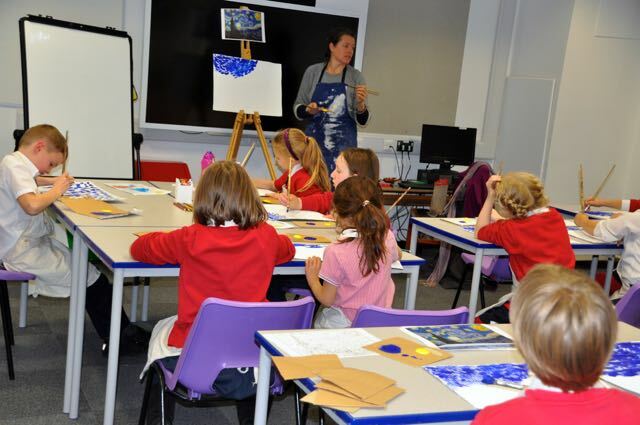 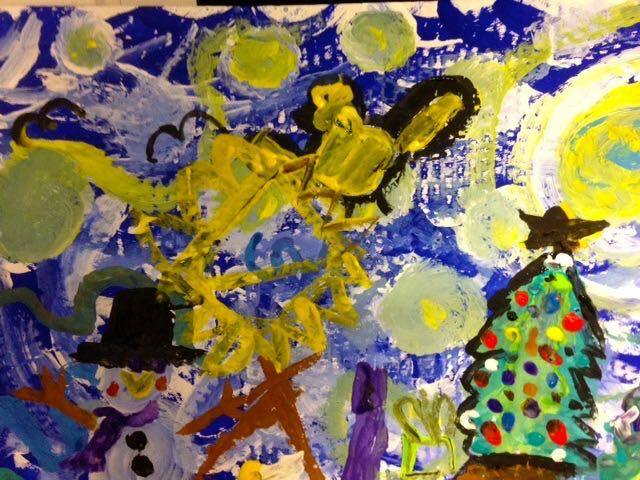 As winter draws in and Christmas approaches children have been looking at Van Gogh’s iconic image The Starry night. 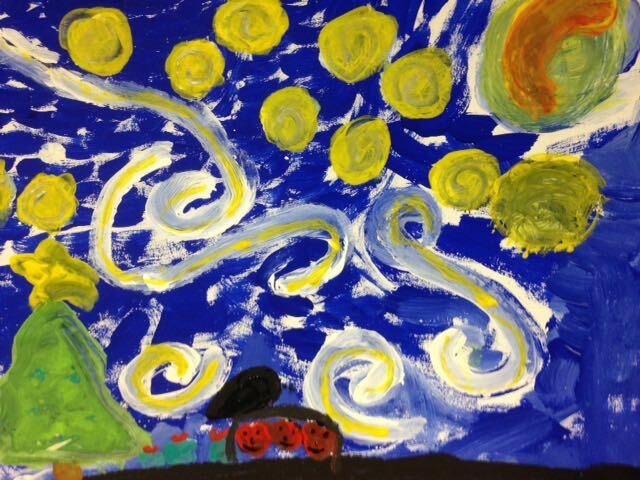 Veena used a traditional teaching method with the children to help them look at the painting and reinterpret it in their own way. 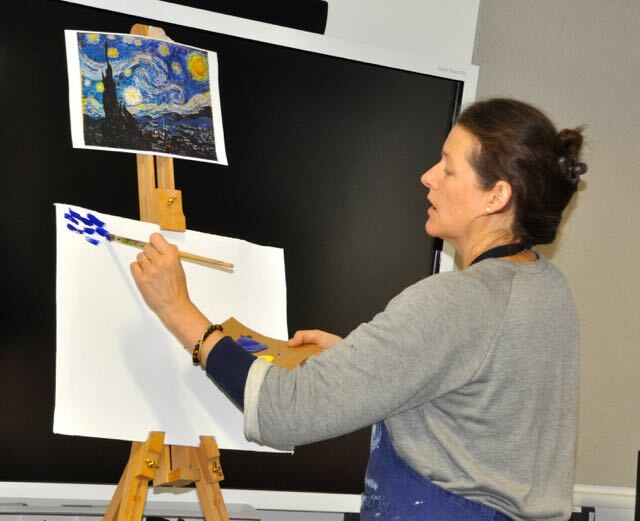 Veena often runs pop up painting workshops where adult groups meet to paint together and reproduce paintings in various styles. 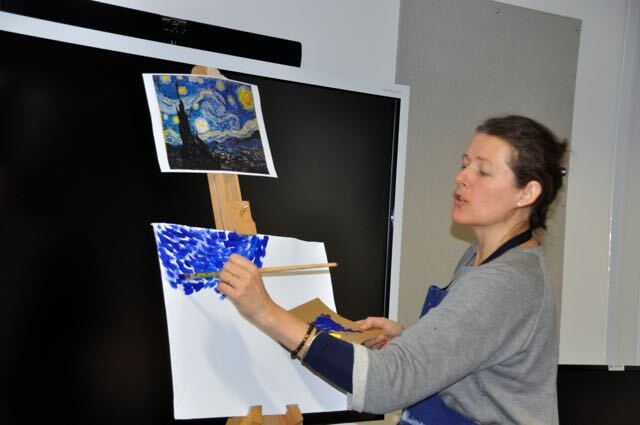 She leads the session as ‘Master’ (we like ‘Mistress’) and the group simply paint together - copying the work, gestures and techniques of the ‘mistress’, whilst adding in their own personal touches. 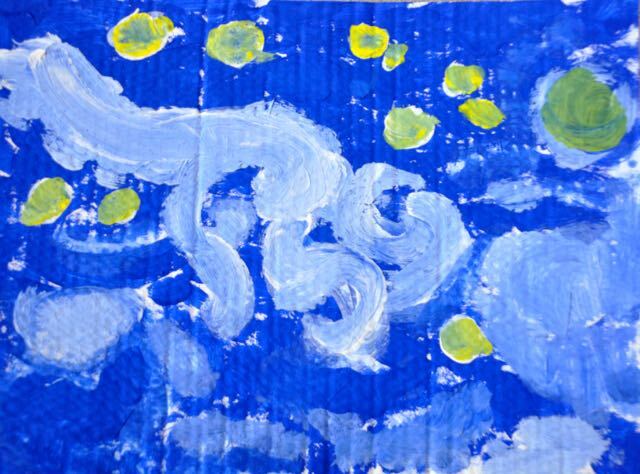 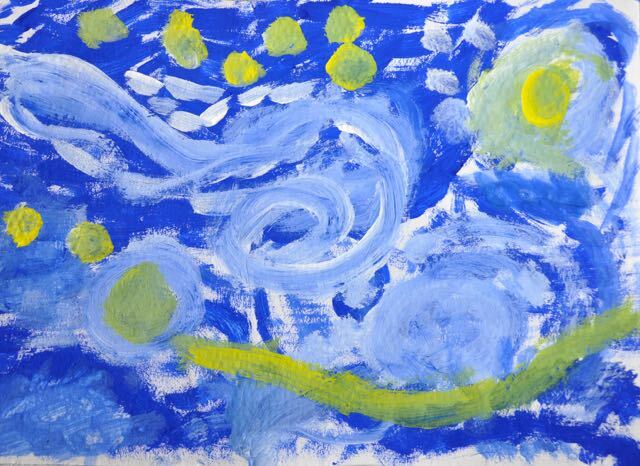 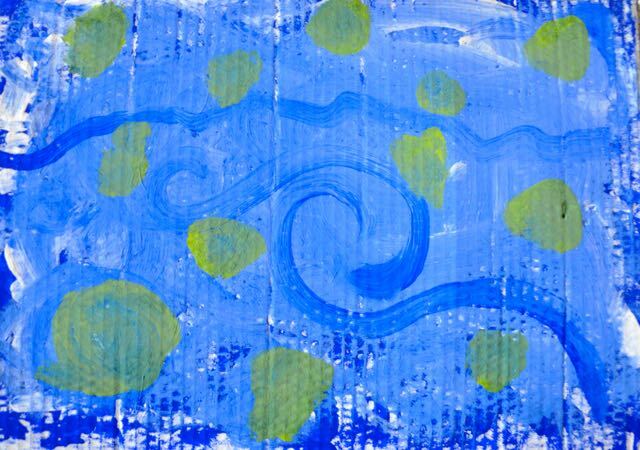 Veena gave each child a white primed card surface of card and some blue, white and yellow paint. 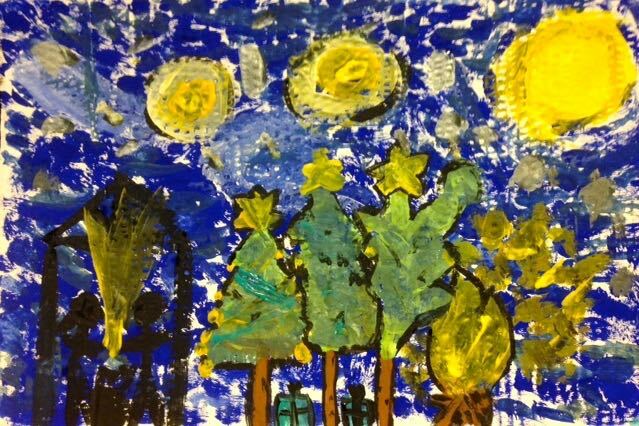 While we were setting up, children looked at Van Gogh’s Starry night and made a simple colouring of the image to focus their looking. 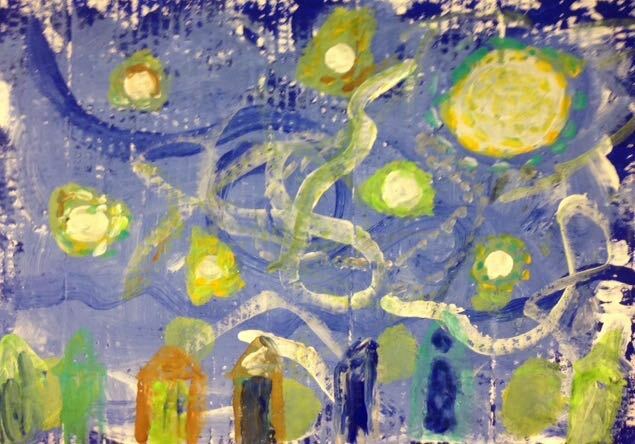 Veena then began to paint and the children followed, discussing style and technique as they went. 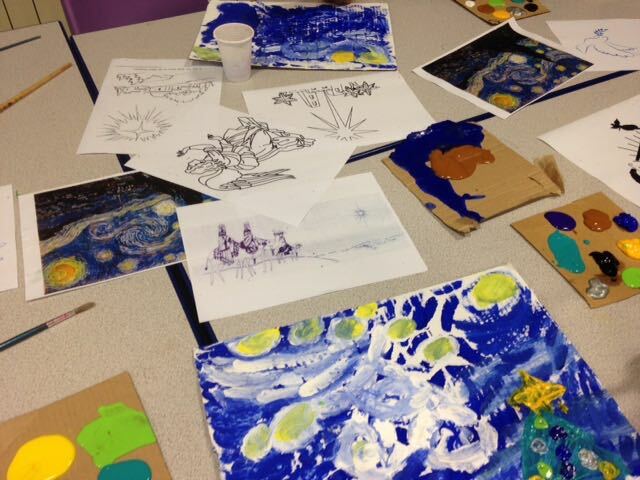 It was interesting to see how the same starting point created so many different approaches. 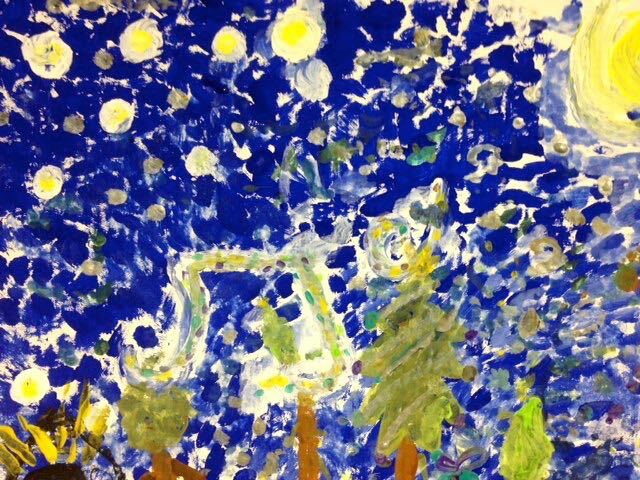 The children completed the background in the first session. 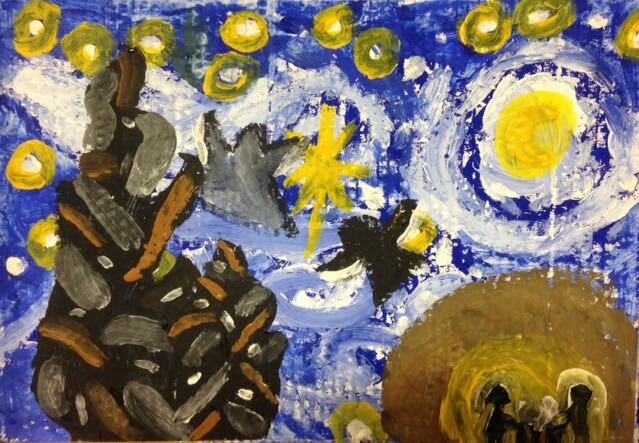 In the second session the children began to interpret the painting from their own perspective. 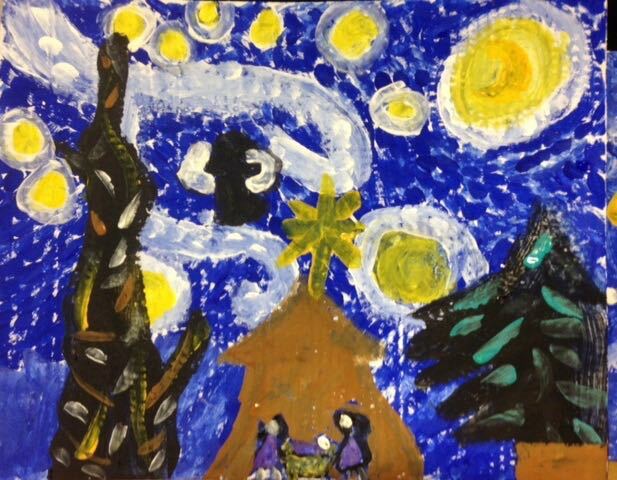 Veena introduced the idea os a starry night in Bethlehem. 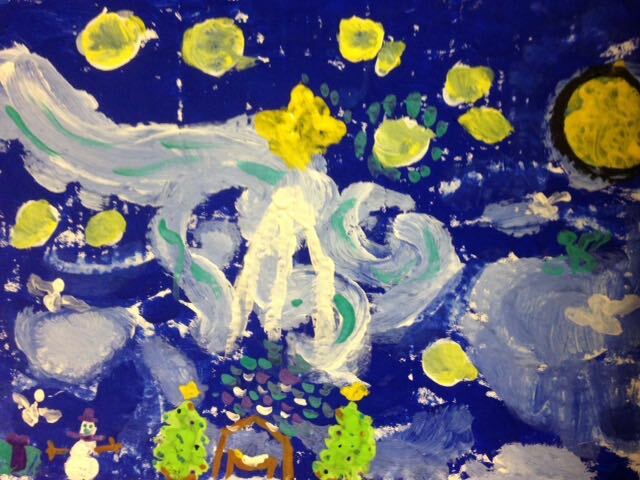 They discussed what Bethlehem meant to them and the Children added in new references, both contemporary, religious or those significant to them when thinking about this iconic scene. 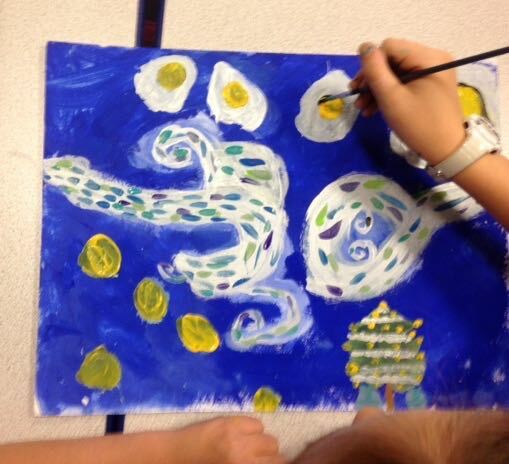 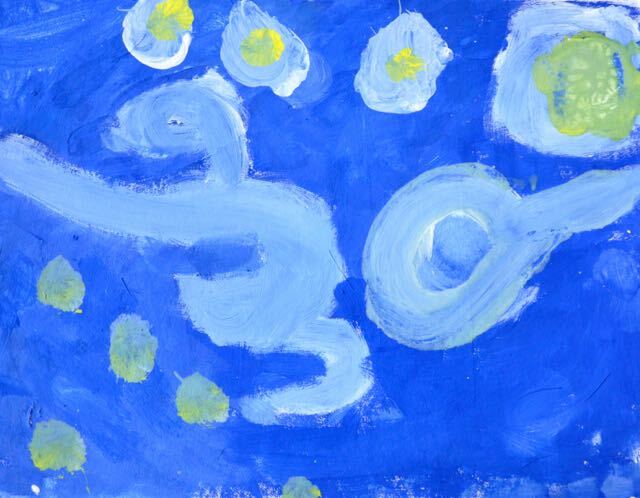 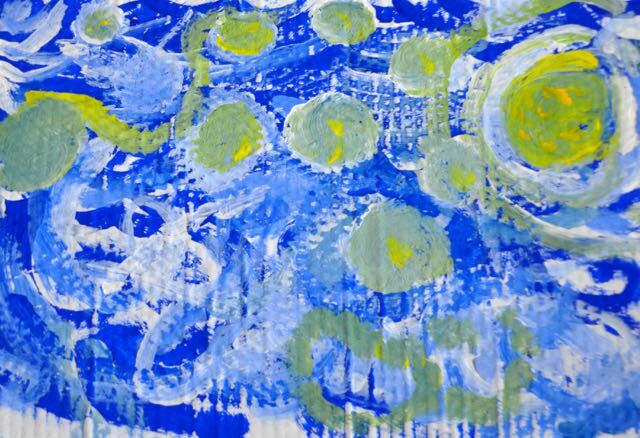 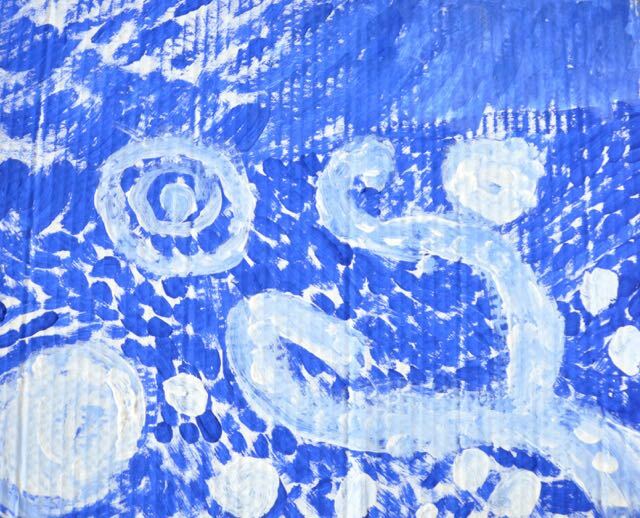 The resulting paintings were really beautiful and meaningful – they would make lovely Christmas cards. 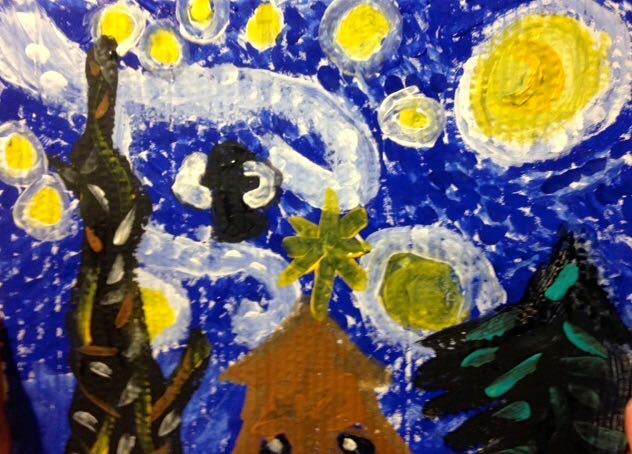 Veena tells me the children had never been so focussed and quiet during her sessions – the atmosphere was delightful, she said. 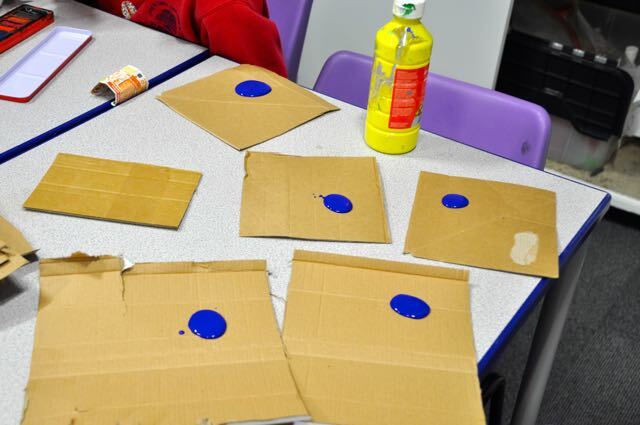 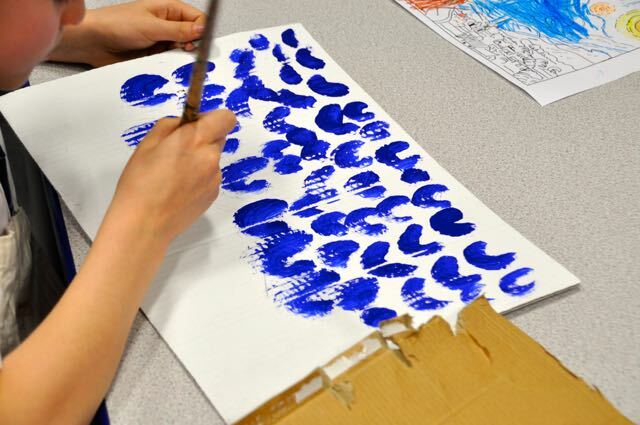 Next week the children will add some finishing touches using some glow in the dark paint, for a really contemporary twist – they can’t wait to finish! 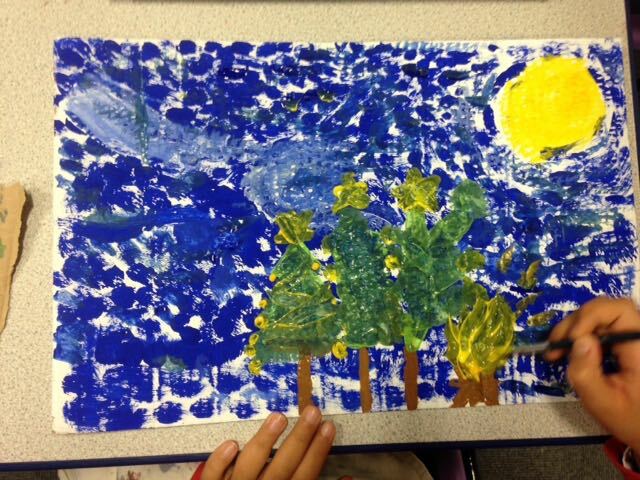 Thank you Veena for a wonderful term’s work – you have inspired the children make some stunning work.